While Andhra Pradesh chief minister Chandrababu Naidu held a protest in New Delhi, placards comparing Modi to a chaiwallah and the need not to hand over the prospects of the country into the hands of a chaiwallah emerged. Opposition parties, including the Congress have heaped the choicest of abuses against Prime Minister Narendra Modi and his men several times. During protests by Andhra Pradesh chief minister Chandrababu Naidu in New Delhi, placards insulting Modi were displayed. The placards questioned the need of handing over the prospects of the nation into the hands of a tea-seller. Over the years, the Congress and its allies have never shied away from using the filthiest of abuses against Narendra Modi. When Dr BR Ambedkar, the founding father of the Indian Constitution laid stress on constructive criticism in a healthy democracy, he would not have dreamt even in his wildest dreams that criticism would go down to the level of gutter! 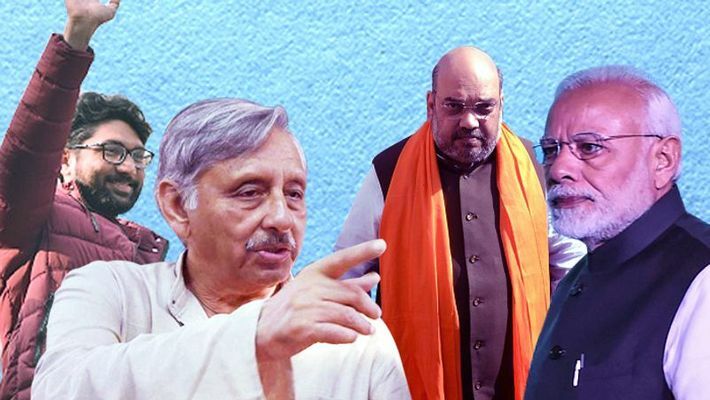 Cutting the long story short, PM Modi and the BJP chief Amit Shah, in particular and the BJP in general have been at the receiving end on numerous occasions. The Congress and its allies have always used the choicest of abuses and affronts against Modi and Shah and have only exposed how thuggish, mediocre and malevolent they have been over a period of time. Let’s start with the latest. While Naidu was holding a dharna in New Delhi, Modi was compared to a tea-seller. This is certainly not the first time the PM has been subjugated and mortified. In fact, the Congress has always made its trait and tenet to slight the PM and his men very, very often. We give you a lowdown on this! MANISHANKAR AIYAR’S ‘MODI CAN NEVER BECOME THE PM’ REMARK! It was the year 2014. The Congress had planned a grand convention in New Delhi. The who’s who of the party had been attending the event. At that point of time, the prospects of the Congress in the upcoming national elections had been on the downhill. And Mani Shankar Aiyar could not control himself. When being interviewed, he said Modi could ‘never ever, ever become the PM of India’. Not just that he went on to say that Modi could open a tea stall at the venue, and that the Congress would help him set up one! This statement was the last thing expected from any politician, not to talk of a ‘cultured’ Aiyar. In fact, it would not be wrong to say that these statements had a tremendous impact on the people of India and instead of helping the Congress storm back to power, actually, ended up being counterproductive! MANI’S ‘NEECH’ REMARK EXPOSES WHO’S ACTUALLY ‘NEECH’! Indeed Aiyar is a motormouth! After the BJP stormed back to power in 2014, he should have understood that he could not demean the PM. But an uncontrollable and uncultured congressman that he is, he went on to address Modi as ‘neech’ which, in English translates to ‘low level’. Ipso facto, the remark was made keeping in mind, Modi’s caste. Of course, he was expelled from the party. But he seems to have not learnt his lessons. MANI’S HATE FOR MODI ON PAK SOIL! India is a country that is an epitome of pluralism. In fact, the foundation of the country lies in its diversity, not just in cultures but even in its thought process. After all, isn’t India a shining example of unity in diversity? We are bound by the ‘Indianness’ in us. At no cost do we speak ill of our country or our Prime Minister on a foreign soil. But perhaps, Mani doesn’t fall in this bracket. When he was in Pakistan, he once again exposed himself when he openly campaigned against Modi and the BJP and sought Pakistan’s help in ousting Modi sarkar! CONGRESS AND CALUMNY ARE SYNONYMOUS! Honestly, the story doesn’t end with Aiyar. You can go on adding to the list. Recently, BK Hariprasad, one of the general secretaries of the Congress, ridiculed Amit Shah when he was diagnosed with H1N1 and admitted to AIIMS. At a time when he had to bury the political hatchet and wish him a speedy recovery, he chose to play politics and went on say that the BJP chief contracted H1N1 as he was trying to dislodge the coalition government in Karnataka! It was nothing but pure devilishness on his part to have made such a statement. What more do we say? Physical ailments can be cured, but the sadistic pleasure or what we call in psychological terms ‘Schadenfreude’ can never be cured! Another Congressman Salman Khurshid had termed Modi ‘impotent’ as well! A so-called youth leader continuously issues derisive statements against Modi. He is none other than Jignesh Mewani, presently an MLA in the Gujarat Assembly and a social activist. More often than not, he issues diatribes and polemics against Modi, and even Modi’s mother. Speaking from a political point of view, there might be a lot of differences, but when it comes to family and more importantly, motherhood, the Indian culture accords the highest value to a mother. During one of his rallies condemning the death of journalist-activist Gauri Lankesh, Jignesh exhorted the youths to go to Delhi, stamp Modi’s chest and ask his mother (Heeraben Modi) as to why she gave birth to a man like Modi! Apart from this insult, Mewani has consistently used the word ‘haram’ against Modi and has also called for disruption of Modi’s speeches a number of times. Sthithaprajna is a word which finds a mention in Bhagwad Geeta, which is revered by many across religions and countries. Its meaning roughly translates to stoicism or the ability to remain indifferent to both bouquets and brickbats. After having received so many abuses and affronts, Modi has chosen to remain silent on the issue, personifying the ‘sthithaprajna’ trait. After all, he believes in improving the living conditions of his subjects and allows his work to define his culture and composure.